Anyone bearing responsibility for others is naturally cautious. However, few truly dangerous situations allow time to plan. Put a Cautious character responsible for more than himself in a situation with a high stakes and a ramped up ‘ticking clock’, forcing them to act. Do caution and instinct go hand-in-hand, or do they lay at opposite ends of the spectrum? Explore this relationship with a cautious character–will their instinct lead to caution, or does caution actually hamper their instincts, forcing them to stop and think about the pros and cons rather than act in a way that feels natural? Build a worthy protagonist with a mix of unique strengths that will help him overcome obstacles and achieve meaningful goals. This sample, along with the rest of the character trait entries, has been expanded into book form. 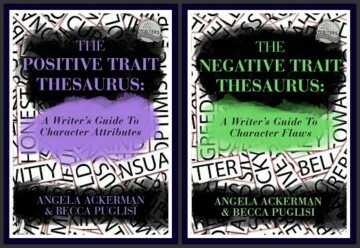 Together, the bestselling NEGATIVE TRAIT THESAURUS: A WRITER’S GUIDE TO CHARACTER FLAWS and POSITIVE TRAIT THESAURUS: A WRITER’S GUIDE TO CHARACTER ATTRIBUTES contain over 200 traits for you to choose from when creating memorable, compelling characters. Each entry contains possible causes for the trait, as well as positive and negative aspects, traits in supporting characters that may cause conflict, and associated behaviors, attitudes, thoughts, and emotions. For more information on this bestselling book and where it can be found, please visit our bookstore. Love working online and having your favorite description resources in one place? We’ve got you covered. The entries from the Positive Trait Thesaurus book have been integrated into our online library at One Stop For Writers. Now you can search and cross-reference between all our thesaurus collections quickly and easily. Interested in viewing a free sample? Register at One Stop and see all that this intuitive library for writers has to offer. An impulsive/responsible combination sounds like a great character combo. Very unusual, but realistic if you write it consistently. This is how you create unique characters, so I say go for it! Like @patonlorraine, I’m now wondering if it’s realistic to have my character be impulsive, though he feels a great responsibility for his brother (who he partly raised). Sounds like they’re in contradiction. OTOH, you’ve also said the contradiction may be good! Rick in The Walking Dead comes to mind. I haven’t seen the finale yet, but I know that this season his caution has been a focus of the plot. Lots of drama comes from pitting the cautious hero against the reckless/gunslinger type of hero. Love Elrond. Especially because when push comes to shove he does send the elves to fight the Uruk Hai. You go, Elf. You know when a cautious character acts, they mean business. I enjoy your character traits posts! Elrond is a perfect choice! Cautious, but not to a fault. Cautious in wanting to expose all the possible consequences, to not rush in making a decision. Caution with wisdom. Seeing Elrond makes me want to watch those movies again. Thanks for the great post. Hah! That’s a good one. This nails me perfectly, and my two daughters as well. Though I was neither overprotected as a child nor overprotecting as a parent.